When I first heard about Chrome OS, I was ecstatic. I love the idea of being able to run my apps in the cloud and have them seamlessly sync with my data without thought. I realize the current practical limitations, especially for developers. But for the average person that just wants to surf and write a few papers, would Chrome OS suffice? I think so. It’s amazing how many times techies will dismiss current technology trends as solutions in search of a problem. Case in point: as you probably know, Cr48 laptops were just released to testers. Some Slashdot commenters have made statements dismissing the utility of such a laptop. The problem with ChromeOS is it is trying to solve a problem them doesn’t exist. Why upload data into the cloud if you don’t need to share it or have access to it on the move? You don’t want to need to upload all your data to the cloud before you can do anything with it. Cloud computing makes sense for people who want to rent computer processing power on an adhoc basis to solve computational problems.Computing needs to gradually move to new technologies, it rarely makes huge leaps. ChromeOS would be better being a full Linux desktop for now with cloud services instead of being fully cloud based. Even if it were a problem, it’s a problem they’ve solved on all the other OSes, because you can access the same Google apps on those. Investing in a ChromeOS machine provides you a set of advantages that are all present on lots of other machines, with none of those machines’ other benefits. It’ll have to sell on simplicity itself and a low device cost if it’s to really work as a product. 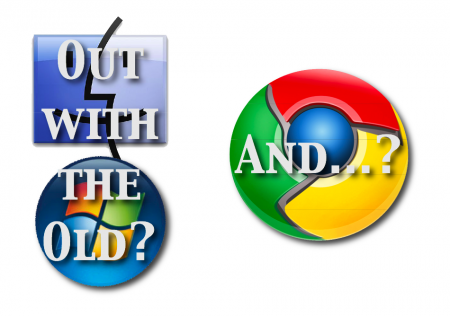 The problem with ChromeOS is it is trying to solve a problem them doesn’t exist.The problem that exists is your Mac, Windows or Linux box gives you the ability to ‘change’ to some clean state when you quit your browser. Google wants to track you from power up to shutdown and Chrome is the first good attempt in that direction.ChromeOS is like a browser that never gets its cookies cleaned and reverts to a cookie safe hardware state on booting. A huge leap in tracking your habits. This sentiment isn’t just isolated to Slashdot either. You can find it on MacWorld, BetaNews, and ArsTechnica. This is not the first time that techies have lambasted up and coming technology or recently released technology. Consider Rob Malda’s (founder of Slashdot) comment when the iPod came out: “No wireless, less space than a nomad, lame.” The iPad was criticized as being just a big iPod Touch. Back, in June I wrote a piece on Steve Jobs being a visionary similar to that of Henry Ford. I used the iPhone 4 as an example. I submitted this piece to Reddit and it was criticized. I’m convinced that you should ignore the techie while building your business. Unless of course, the techie is your customer. What do you think of Chrome OS? What do you think of techies’ assessment of the success of technology?